Addiction and homelessness can often go hand in hand and they are both difficult problems to overcome. Especially when an individual is struggling with both of these issues at the same time. The National Coalition for the Homeless reports that approximately 38% of homeless people are are addicted to alcohol, and over 25% are addicted to some type of drug. According to a survey conducted nationally, the number one reason for homelessness among single adults was substance abuse. Drug abuse is more prevalent among the youth while alcohol abuse is more prevalent among older people. 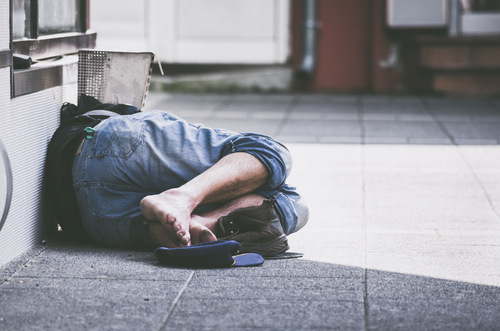 While not every homeless individual has had a substance addiction prior to experiencing homelessness, many individuals do turn to drugs or alcohol upon becoming homeless. This leads to addiction and further exacerbates the situation. So what is a solution? Homeless individuals struggling with an addiction deserve help, just like anyone else. There are many homelessness and addiction treatment centers in the United States. All of them may offer slightly different approaches to treatment, and what works for one individual may not work for another. The homeless individual must focus on finding a center that matches all of their needs, and not merely their addiction issue. It is a fact that many individuals who struggle with substance addiction can also have a co-occurring mental health disorder. Therefore, a recovery program must be able to diagnose that. There are dual diagnosis facilities specifically designed to treat co-occurring disorders. It is also important the staff members at the facility have experience in dealing with the unique issues that come with being homeless. It is extremely important for the individual to attend therapy meetings when staying at a homelessness and addiction facility. Therapy has many different approaches and different facilities will offer different types. The right therapy is key to a successful recovery. Therapy helps the individual to develop healthy strategies to cope with stress, that don’t involve drugs or alcohol. One of the most popular approaches to therapy is the 12 Step Program. The program provides a supportive and encouraging environment in which people share and listen to each other’s experiences about homelessness and addiction. The timeline to stay in a recovery center varies and could last from a few weeks to a few months. According to research, the longer a homeless individual with an addiction spends in recovery, the higher the likelihood that the individual will achieve and maintain sobriety. It is important that whatever facility the individual chooses is able to prepare them to rejoin society, and offers an aftercare plan. Aftercare is any ongoing treatment taking place after the initial recovery program and can include outpatient treatment, individual therapy or support groups.